Homestyle Kabuli Chana Curry – A simple, delicious and lightly spiced chole masala recipe. Wherein white chickpeas are cooked in an onion, ginger, garlic, and tomato based gravy. However, there are a lot of variations of this dish. As people use spices in different ratio. Some leave the spices whole. Some even use sliced onion and diced tomato to make the sauce. Usually, a chana masala spice mix powder is made before preparing this curry. Some people even use the readymade chana masala spice mix in this. 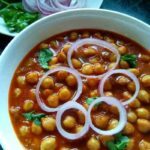 This is the easiest chana masala curry as there is no need to prepare any spice mix powder beforehand. This homestyle Kabuli chana curry starts with soaking the chana. Next comes pressure cooking until done and finally preparing the masala gravy and mixing everything together. Here for gravy, you need to make a masala paste and some grated tomatoes. Frying the masala is an important step. It has to be cooked really well until oil separates. It will take around 15-17 minutes over lower medium flame. Hence patience is the key. 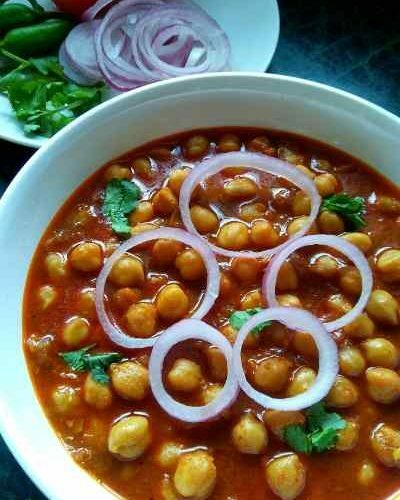 Serve this chole masala curry with roti, paratha, poori, bhature, steaming hot rice or with any flavored rice. It just goes well as a sides to any dish of your choice. So let’s make this homestyle kabuli chana curry. Let me know your thoughts about this chana masala recipe in the comment section. Also, you can connect with me on Instagram, Facebook, Pinterest, and Twitter. A simple, delicious and lightly spiced chole masala recipe. Wherein chickpeas are cooked in an onion, ginger, garlic, and tomato based gravy. Wash the channa well in running water. Then Soak them in sufficient water for 8-9 hours or overnight. Pressure cook the soaked chana by adding salt, turmeric powder, baking soda, bay leaf, big cardamom, cinnamon stick, black peppercorns, and water until 6 whistles over medium flame. Then turn off the flame and let it release the pressure on its own. Once done, transfer the boiled chana with water to a bowl and remove those whole spices. In the meantime grind all the blending ingredients together (written under for blending) into a smooth paste. Heat oil in a pan. Add the bay leaf, star anise, cinnamon, asafoetida/hing and saute for a few seconds. Add the blending paste and saute over medium flame until the oil separates or the masalas cooked well. It will take around 7-8 minutes. Once done, add the grated tomatoes. Followed by turmeric, kashmiri red chili powder, salt, kasuri methi, and amchoor powder. Then saute for a minute or two. Cover and cook for 10 minutes more in lower medium flame. Stir in between. It is important to make sure the masala does stick to the bottom. Add the boiled chana with water. Stir to mix. Cover and cook for 10 minutes more. The chana masala is ready to serve. Serve hot by adding some chopped coriander leaves and sliced onion rings. If you do not have amchoor powder then you can add lime juice at the end. Addition of baking soda while cooking the chana really helps to make the chana very soft. This post is added to the 127 My Legume Love Affair hosted by my dear friend and fellow blogger Amrita. Conceptualized by Susan and carried forward to date by Lisa. I recently bought some chana peas and roasted them with some mixed spices – they were delicious. I’ll have to give your curry a go. They’re such a cheap food, there really is nothing to lose! This curry sounds so delicious and easy to make. I love all the spices you used in various steps of the recipe. Looks fantastic. i love chana masala so much. it is one of my favorite dishes ever. i def will have to try this recipe – looks amazing!! Yum! Chickpeas are my fave and this chana masala looks so amazing! Definitely going to try this recipe! My family loves curry, I’ll have to give this recipe a try this week one night for dinner. There are so many spices in this that I bet the flavor packs a really big punch. This sounds really aromatic and delicious! I so love chickpeas! They are not only healthy but delicious too! This chana looks wonderful. Can’t wait to make it! You can never have enough curry recipes, and this one is fantastic! The spice mixture is super flavorful and so delicious. Thanks for sharing! 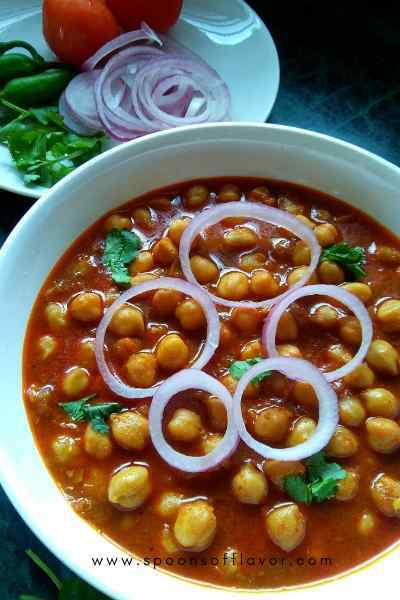 love this home style chana curry.. I would pair with my parathas.. I am hosting this mong My Legume Love Affair event… I would request you to add this recipe in this event..
I’ve never had chana masala but I’m looking forward to cooking and trying something new. Thanks for sharing! 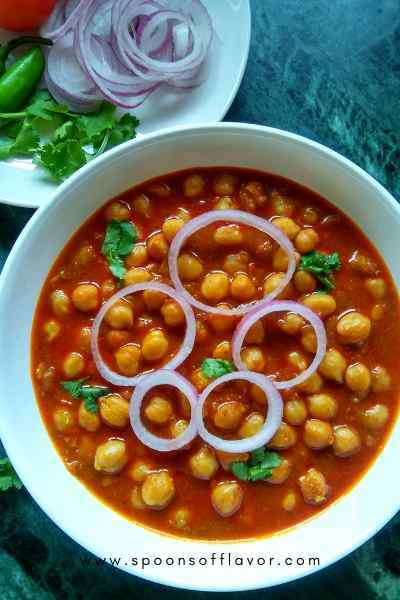 I adore chana masala! It’s one of my favorite dishes when I go out for Indian food, but i’ve never tried to make it at home! Thank you for this recipe!! I’ve tried all kinds of masala recipes but I think the ones that are lightly spiced are my favorite. Definitely need to give this Homestyle Kabuli Chana Curry recipe a try! I was thinking of trying a homemade masala recently so this recipe had some amazing timing 🙂 Can’t wait to make it this weekend! My goodness, this looks delicious and flavorful!